Crew Comments: First combat mission #317 19 February 1945. 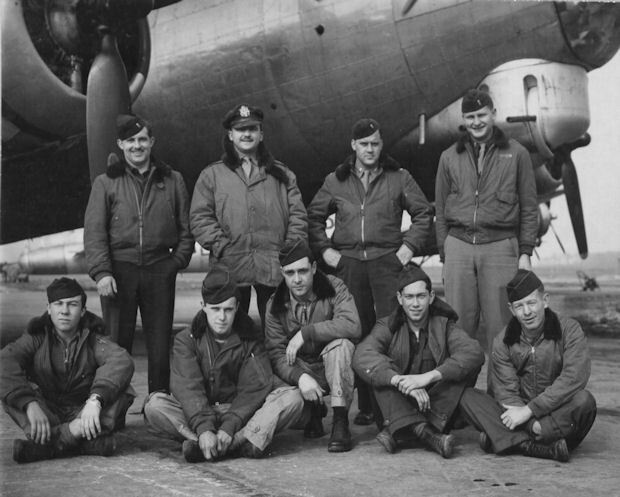 After ten combat missions (#329 - 03 March 1945) crew was made a lead Crew. Flew six missions as a Squadron Deputy Lead and Lead crew. Lt Shields flew mission #352 - 05 April 1945 as Pilot of the Weather B-17 and on mission #356 - 09 April 1945 as Pilot on the Scouter B-17. ** Sgt Owen W. Moren removed from the crew following the 22 February mission when crew size was changed from nine to eight men. He flew three additional missions with the Shields crew as a replacement gunner. 21 February 1945 (#319), Nurnberg, Germany. Ball Turret froze in down position. Crew removed the bolts to drop the turret in a river or the "Wash". The operations Officer insisted that their B-17 be landed with the Ball Turret in the down position. After circling for over one hour the B-17 was landed at Molesworth wrecking the Ball Turret. 23 February 1945 (#321), Kitzingen, Germany. Formation was attacked by three ME-109s who were shot down by P-51 escorts. 19 March 1945 (#340) Plauen, Germany. Attacked by three ME 262 German Jets. No losses. Due to a fuel shortage landed at the Redhill Airfield south of London. 21 March 1945 (#342) Hopstein/Hesepe, Germany Jet plane Airfield. "We were carrying fragmentation bombs. Somehow two of our Frag bombs collided and exploded after "bombs away," knocking out the #3 and #4 engines. The engines were feathered and the crew and B-17 limped back across Germany. After landing at Molesworth there were huge holes in the engines and wing. The bomb bay doors looked like sieves and I stopped counting when the number exceeded 300-plus." [Courtesy of Rex Chambers, Bombardier] Heavy and accurate flak cut off Ball Turret Gunner S/Sgt Nolan Herbert's oxygen supply and flying glass cut his hands. He was forced to vacate the Ball Turret. 28 March 1945 (#347) Berlin/Spandau, Germany. Had to feather props one-half hour after bombs away and made an emergency landing at the 416 BG Airfield #69 at Laon/Athies, France. Made emergency repairs to permit take off on the next day. 09 April 1945 (#356) - Flew as the Group Scouter B-17 to front lines then circled Paris and flew back at 4,000 feet to England. Radio Operator, John Prestage, forgot to turn on the IFF (Aircraft Identification) set which caused a RAF alert as the crew crossed the English Channel at a low altitude. 09-10 May 1945 (Post War) - Participated in the "Continental Express" ground crew tours of continental Europe 303rd BG(H) targets.